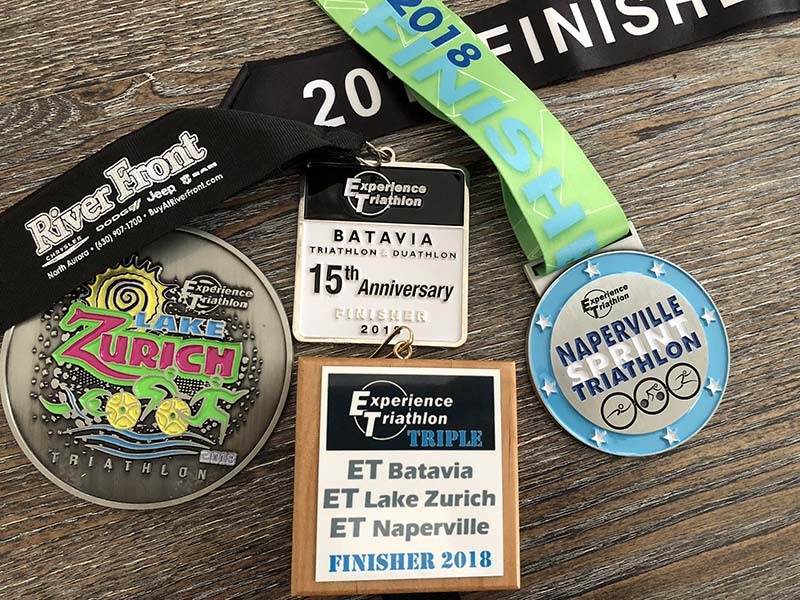 If you’ve been following my triathlon-filled summer of 2018, you’ll know that I finished the Experience Triathlon Batavia Sprint and Lake Zurich Sprint. I’m officially hooked on triathlons. Sometimes I doubt myself and get anxiety, but I still can’t get over the feeling when I cross the finish line. This past weekend I completed the Experience Triathlon Triple Challenge by finishing the Naperville Sprint Triathlon. The Triple Challenge was to finish the Batavia Triathlon in June, the Lake Zurich Triathlon in July, and the Naperville Triathlon in August. This time the timing mat was close to the swim exit, so this is closer to my actual swim time. The swim was good. There were a lot of people there and they started four at a time. I lined up between the 8 minute and 10 minute groups and it took a good 20-30 minutes before it was my turn to get into the water. The swim was in a man-made pool (quarry lake) and the course was in the shape of an M. The water was shallow for the front half of the course and deep for the back half. The water was around 80 degrees, so nobody wore a wetsuit. I self-seeded myself better this time and at least during the swim to the first buoy I didn’t have any contact with anyone. As we made the turn and headed towards the middle buoy I had a few people swim at a weird angle and swim into my side and I think I kicked someone that came up on my feet. Almost everyone was standing up and walked around the middle buoy, so I did the same to avoid swimming into them. I made my way to the last buoy and turned towards the swim exit. A lot of people stood up early and walked or ran in water that was above their waist. I kept swimming since it was faster to swim and saved my legs. This included a 400-ish yard run from the swim exit to my bike. My actual transition at my bike felt fast. I bought some Lock Laces for my shoes and I love them. I didn’t have to sit down to put my socks and shoes on. Given my size, I tend to burn a lot of energy, so I had a Honey Stinger Gel. I also had Gatorade Endurance on my bike. The bike course was 2 loops and was well organized. There was some elevation, but it was mostly flat and fast with 1 U-turn in each loop. The roads were closed off to traffic and the lanes were wide enough so you could pass 3-wide if you had to. For the most part, the slower riders stayed to the right and allowed plenty of room to pass. When you approached the Y split for the 2nd loop or to exit to the bike finish, some people got confused and had to cross over the cones to do their 2nd lap. I felt like I went pretty hard on the bike and passed quite a few people. I also got passed by people on TT bikes though. I really felt my legs after getting off the bike. I tried to jog but I had to walk a bit first. I racked my bike, had another Honey Stinger Gel, and put on my bib belt and headed towards the run out. The run was good. It started off on a trail into the woods, which was narrow, but there weren’t many people around me so it didn’t feel crowded. Then it went onto a sidewalk and onto the street. There were aid stations about every mile with water and Gatorade. Even though I’ve been training for all three disciplines, my run pace has actually been slower this year compared to where I was at the end of last year. This was one of my faster 5k’s of 2018. The last 1/10th mile was back through the park where the crowds were and mostly downhill. I’m very happy with my time. Overall, I finished in the middle for almost 1300 people. The swim was a little shorter than Lake Zurich but the bike was about a mile longer and I cut over 5 minutes off of my total time. The energy at the finish line was great as you run through the park. To round out 2018, I have the Chicago Olympic Triathlon in a few weeks. For 2019, my wife and I have decided we’re going to sign up for Ironman 70.3 Muncie. The swim distnace still intimidates me, but I know I can get it done. I still want to get some practice in with my wetsuit before Chicago, but I’ll be traveling for work for a week which doesn’t leave much time.